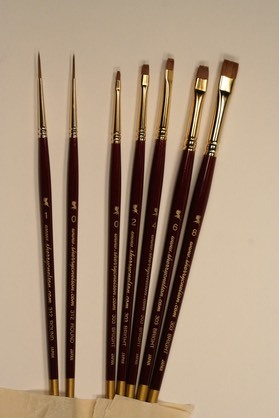 The Winsor & Newton Series 710 and Series 740 brushes that Sherry used for so many years have been discontinued. We have been working directly with our manufacturer to create a line of brushes to replace them. The new brushes are nearly identical in all respects, from the "feel" of the brush to the perfect chisel edge. Best of all, they give the same wonderful results for painting Sherry's birds, animals, and florals. At our special price, the entire set (7 brushes: 5 brights, Series 303 and 2 rounds, Series 312) comes to $59.95. *Winsor & Newton Artist's Oil Colours - $115.95 includes a 30% discount. 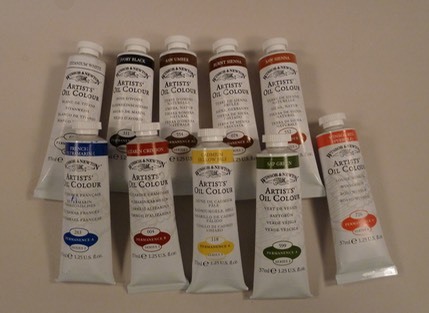 Sherry's Top Ten Favorites (Ivory Black, Titanium White, Raw Sienna, Raw Umber, Burnt Sienna, French Ultramarine, Sap Green, Alizarian Crimson, Cadmium Yellow Pale, Winsor Red). Other colours are available, please inquire. Turpenoid Natural - brush cleaner (non-toxic) 4 oz............ $8.99 each. 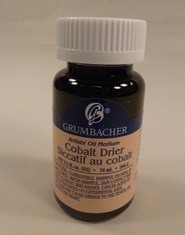 Cobalt Drier 2-1/2 oz. ..................................... $16.95 each. Disposable Palette Pad 9" x 12"................................... $8.40 each. Tracing Paper Pad 9" x 12".............................$6.45 each. Oil-soluble Graphite - Transfer paper (grey or white) .......$1.00 a sheet . Sherry's Choice Palette knife styled after a unique Italian knife for Sherry's technique of mixing drier into paint on the palette, which she demos on her instructional videos. The shape and straight blade of Sherry's Choice Palette Knife allows the paint to easily come off BOTH SIDES - saves paint after mixing.